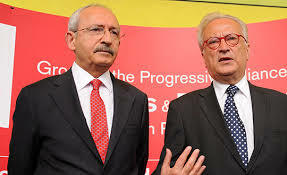 A disagreement last week between Kemal Kılıçdaroğlu, leader of the Republican People's Party (CHP), and Hannes Swoboda, president of the Group of the Progressive Alliance of Socialists and Democrats in the European Parliament, has sparked a debate in Turkish politics. The debate has mainly focused, quite naturally, on the reason for the clash itself. Readers may know this reason, but let me reiterate it briefly: Kılıçdaroğlu held a press meeting in Brussels during which he accused Prime Minister Recep Tayyip Erdoğan of being a dictator, albeit of a lesser degree, like Bashar al-Assad. Swoboda described the comparison as unacceptable and said a bloody dictator who is killing his people cannot be compared to a democratically elected political leader, however justified the criticisms are. This clash is an episode that can be quickly forgotten, I believe. However, Swoboda's comments about the CHP that followed his criticism about the unfortunate comparison could play a critical role in the CHP's political future. This “old guard” is not only opposed to the settlement process under way but has adopted a conservative position over the efforts to draft a new constitution, which include articles relating to the right to education in the mother tongue and a new definition of citizenship. These two critical issues constitute the keys of a definitive settlement that aims to integrate Kurds into democratic life. The Justice and Development (AK Party) is ready to make these radical changes and so is the social democrat side of the CHP but not the Kemalist faction. The differences in thinking between these two groups within the CHP recently became public knowledge following a declaration made by the social democrat faction about the settlement process as well as democratic reforms. Contradictory views among the representatives of the CHP at the parliamentary Constitutional Reconciliation Commission on the critical issues mentioned above are actually not a secret. Kılıçdaroğlu denies the existence of a fracture in the CHP and is desperately trying to hold together the two opposing factions within the party. Swoboda's comments and suggestions about the CHP not only make clear the confirmation by European Socialists of the existence of two opposing factions in the CHP but also their willingness to encourage Kılıçdaroğlu to clearly choose the social democrat camp and put the CHP on a progressive track. I am not sure that Kılıçdaroğlu will make such a choice soon. He will try to keep the party in one piece at all costs until the local elections in March 2014. However, at this point it remains unclear whether a lethargic CHP can avoid the division if the settlement process succeeds. In this context the rift between the two factions would be exacerbated and the CHP would be squeezed into a corner, obliged to make a choice. Swoboda's “intervention” in the domestic affairs of the CHP can accelerate the dénouement in one way or other.